710 Study San Rafael Neighborhood Posts: What does it take to map an earthquake fault? What does it take to map an earthquake fault? 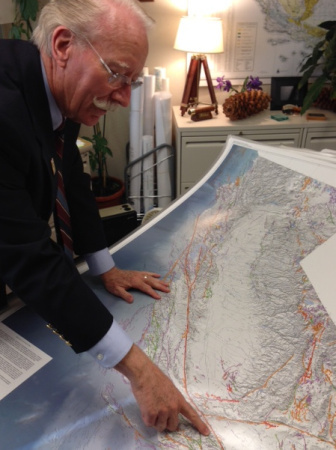 State Geologist John Parrish shows off a map of California with 15,000 faults on it. He says there are likely many more faults that have not yet been discovered. How do you map something you can't see? That's the question geologists face as they try to pin-point the exact location of a major earthquake fault in Hollywood. The so-called Hollywood Fault runs under the neighborhood, and while traces of it can be seen in the landscape, the rift itself is hidden deep beneath the ground. It's at the center of a fight between a developer, Millennium Partners, and local residents who claim a pair of planned skyscrapers would sit directly atop the fault. The California Geological Survey is working to map this hazard for the state and set up a buffer known as an Alquist-Priolo Earthquake Fault Zone around it. Alquist-Priolo refers to a law passed in 1972 in response to the deadly 6.6 Sylmar Earthquake the year before. That temblor killed 65 people, injured hundreds more and caused $500 million in damages. Some of the destruction stemmed from what's known as surface faulting. It's when a fault splits the ground above it creating an open seam in the land. Buildings and roads sitting on a fault can be torn in two when this happens, and some were during the '71 Sylmar quake. The Alquist-Priolo Act was drawn up by legislators Alfred E. Alquist and Paul V. Priolo to help make new construction safer by barring developers from building on top of any active faults. Before the state can declare where developers can and cannot build, they need to know where the most dangerous faults are. The problem is that California is full of faults. John Parrish is head of the California Geological Survey. He says his office knows of at least 15,000 faults snaking across the state. "We consider all the faults dangerous," Parrish said. "But if we said you can't build near or on any fault that simply would stop California's economy." For that reason, the Alquist-Priolo Act focuses on "active" faults, ones that shook sometime in the last 11,000 years. Geologists believe they are most at risk for producing another quake. Once CGS identifies one of these faults, they need to map it and create a 500 foot buffer zone around it. This is the Alquist-Priolo, or AP Zone. Any developer looking to build in that zone must first dig a trench or bore holes in the ground to pin-point the exact location of the fracture and to make sure they aren't about to build right on top of it. Parrish says they're supposed to set back at least 50 feet from the fault if they find one. Since the law passed, CGS has created 554 of these AP Zone fault maps. They have around 300 left to complete. But due to budget cuts, the agency is currently only mapping one — the one in Hollywood. USC earth science Professor James Dolan knows that fault well. He created academic maps of the fault in the 1990s. And he knows the process isn't easy. "The first step is to just look in great detail at the contours of the landscape," Dolan said. Faults that rupture to the surface often thrust one side of land over the other creating hills known as scarps. One is still visible from the last time the Hollywood Fault ruptured 7,000 years ago. Look for it north of Hollywood Boulevard at Vine Street. For the official state map, CGS is looking at academic maps like the one James Dolan created, but since the agency’s findings will carry legal weight, it is doing additional research as well. This includes looking at old arial photographs showing the landscape, examining construction records and studying borehole samples to search for the fault, says CGS geologist Tim McCrink. With this kind of data, his team can usually trace a fault to about 50 feet of its exact location, close enough to set up an AP zone. Then, any developers interested in the area have to do a detailed geological dig to make sure they aren't about to build right on top the fault, a process that can cost them up to $100,000. "We don't take that lightly," McCrink said. "We don't want to impose those kinds of costs on somebody unnecessarily." CGS' Tim McCrink says a preliminary map of the new Hollywood fault zone should be ready by January next year. The final map likely won’t come out until the summer. It might be much longer before the Millennium Partners dig on their property to see if the fault runs underfoot. In a statement, spokesman Brian Lewis said the developers won’t start a geologic investigation until two lawsuits filed by opponents of the project are settled, which could take more than a year. Until then, he said, the skyscrapers are on hold.